What are the causes of hypercalcemia? What is the prognosis for hypercalcemia? The signs and symptoms of hypercalcemia can be remembered by the phrase "moans, stones, groans, and bones." Calcium is a mineral that is important in the regulation and processes of many body functions including bone formation, hormone release, muscle contraction, and nerve and brain function. Hypercalcemia is the term that refers to elevated levels of calcium in the bloodstream. Calcium levels are tightly regulated in the body. Calcium regulation is primarily controlled by parathyroid hormone (PTH), vitamin D, and calcitonin. 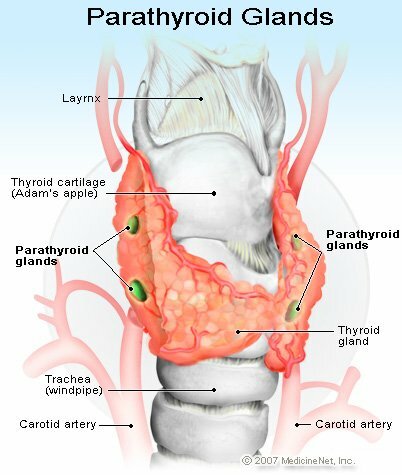 Parathyroid hormone is a hormone produced by the parathyroid glands, which are four small glands that surround the thyroid and are found in the anterior part of the lower neck. Vitamin D is obtained through a process that begins with sun exposure to the skin, the process then continues in the liver and kidneys. Vitamin D can also be found in foods such as eggs and dairy products. Calcitonin is produced in specialized cells in the thyroid gland. Together, these three hormones act on the bones, the kidneys, and the GI tract to regulate calcium levels in the bloodstream. In the majority of patients with hypercalcemia, the signs and symptoms are minimal. In general, the symptoms increase with higher levels of calcium in the blood. In severe cases, the elevated calcium levels can cause abnormal heart rhythms with specific findings on electrocardiogram (EKG). Because of the clinical findings that are seen in hypercalcemia, the symptoms are often described as "moans, stones, groans, and bones". Hypercalcemia is easily diagnosed with a blood test. Diagnosing the causes of hypercalcemia, however, is a more involved process; in addition to a detailed history and physical examination, it may require further blood tests (such as a PTH level and vitamin D level), urine evaluation, X-rays, and other imaging procedures. Is the level of calcium elevated enough to be dangerous, or is it causing symptoms? What is the underlying cause of the hypercalcemia, and does it need treatment? If the hypercalcemia is causing severe symptoms, or if the values are critically high, lowering the blood levels may require hospitalization and the use of hydration, steroids, or even dialysis. There are intravenous medications that can be used to lower calcium as well. If the hypercalcemia is modest, treatment with medications can be administered on an outpatient basis. If the underlying cause is hyperparathyroidism (particularly from an adenoma), there are certain criteria that are reviewed to discuss if surgery should be considered. These criteria include the absolute calcium level, a history of kidney stones or other calcium-related complications, and the amount of calcium seen in a 24-hour urine collection. Based on these findings, surgical removal of the adenoma may be considered. Hypercalcemia cannot be prevented, but early detection can both allow for normalization of calcium levels and lead to an early work-up to define the cause. If there is a known family history of hypercalcemia or hyperparathyroidism, it is worth mentioning this to the health care practitioner; together the patient and health care practitioner can determine if screening is warranted.